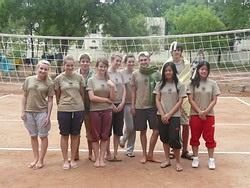 The main objective of their trip was to build both a volleyball and badminton court at a large orphanage in Madurai. Madurai is the second largest city in Tamil Nadu and is not only known for being the Athens of the East boasting the largest temple in southern India, but also notorious for its high population of street children. Madurai Seva Ashram cares for over 130 orphaned girls aged from 4 to 18. It is set in large grounds on the outskirts of the city, and although the children are fed and watered there is a real lack of extra curricular activities for them to get involved in. Earlier in the year the orphanage secretary approached Projects Abroad to request our volunteers help and the Ardingly group jumped at the chance to contribute to this worthwhile project. The courts were built with compacted soil, sand and clay, this was a grueling job of 8 hours a day, but on Friday evening the last line had been painted the nets were up and ready for the following days competition. Although the sports day didn’t show up any future volleyball stars it was great to see the courts being enjoyed, this really was a rewarding project where the group left a lasting contribution to both the orphanage and the children. This goes to show how much of an impact a group trip can have over such a short period of time. Projects Abroad would like to thank each individual volunteer for making this program possible.